The UL SmartStripe is the perfect addition for acquirers and terminal vendors to test and certify their automated payment card acceptance solution with magnetic stripe emulation. Payment terminal user acceptance testing and brand certification requires testing multiple card brands, requiring physical magstripe test cards to conduct the full suite of card brand test cases. These physical test cards can get lost, outdated and corrupted. Maintenance of the complete sets of test cards per brand adds to the inefficiency of manual test case execution which is already a time-consuming process. The UL SmartStripe allows you to simulate magnetic stripe cards. The UL SmartStripe works seamlessly with UL’s payment acquiring test tools, UL Card Simulator and UL Brand Test Tool. With the addition of UL SmartStripe, the UL test tools provide automated test execution and card simulation of contact, contactless and now magstripe cards. Card images provided include images for Visa, Mastercard, American Express, Diners Club, Discover, JCB and UnionPay. The UL SmartStripe emulates magnetic stripe tracks 1, 2 and 3. Simply insert the probe in the magnetic stripe slot of a card acceptance device and keep it in place while all test cases are executed. Leaving the probe in the card reader slot saves valuable test execution time allowing you to perform more efficiently. 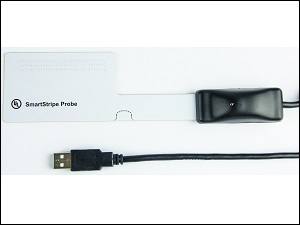 The UL SmartStripe connects to a USB port and works without installing any drivers. The card track emulation is managed directly by the UL test tool. The UL SmartStripe is part of the SmartTesting portfolio developed by UL. The portfolio consists of dedicated hardware components for testing smart cards and terminals (POS and ATM). These include UL SmartStripe (for magnetic stripe emulation), UL SmartLink Box (for contact chip emulation) and UL SmartWave Box (for contactless card and NFC mobile phone emulation). For ATMs and other devices equipped with a motorized reader with a shutter we have a dedicated UL ATM Certification Module for use with the UL Card Simulator and UL Brand Test Tool. The UL SmartTesting portfolio supports POS terminal testing by simulating all three card acceptance interfaces using SmartStripe, SmartWave and SmartLink equipment. The UL Card Simulator simulates the real behavior of a payment card without the need for any physical magnetic stripe or EMV cards. It simplifies the terminal testing procedure in many ways, mainly by eliminating the dependency on EMV issuers and schemes for physical test cards. UL Card Simulator includes support of card images for brand testing of American Express, Diners Club, Discover, DNA, Interac, JCB, Mastercard, UnionPay and Visa.